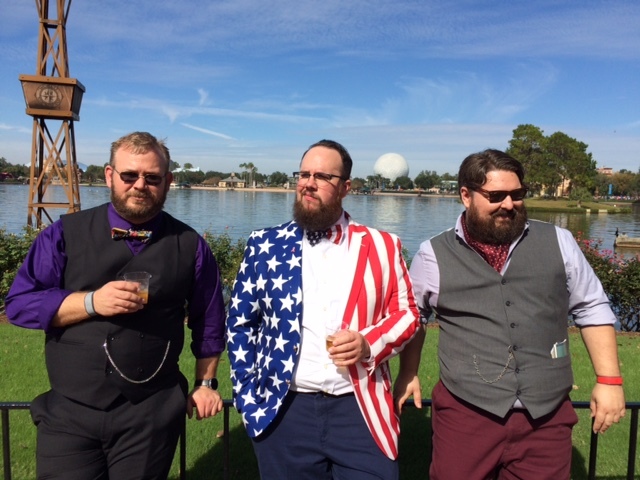 A few years ago I came across an instagram photo from a Disney World Dapper Day event. 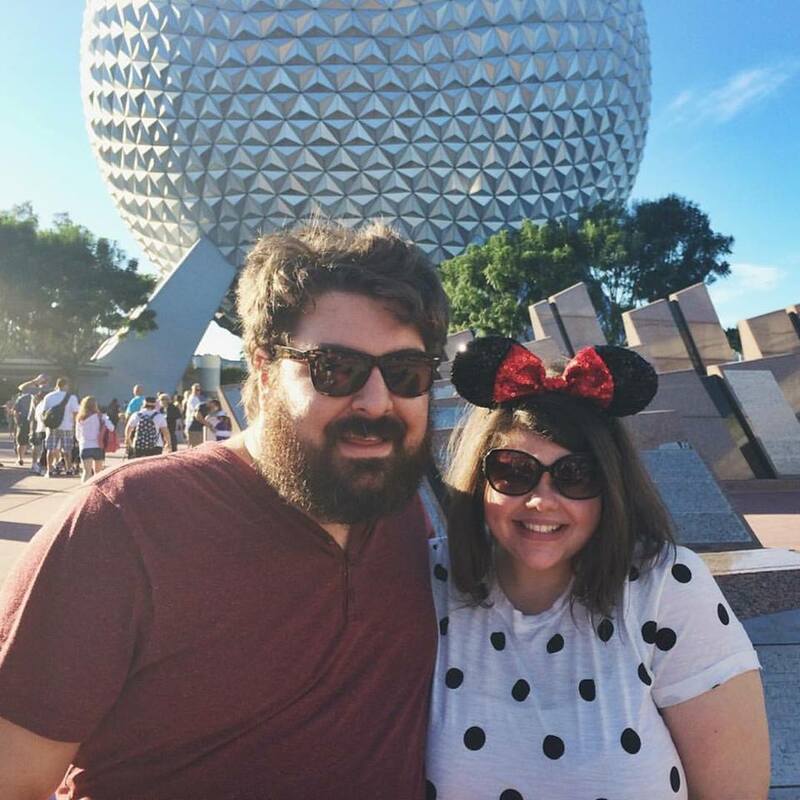 I was instantly smitten with the idea of a fancy outing at the Disney Parks. 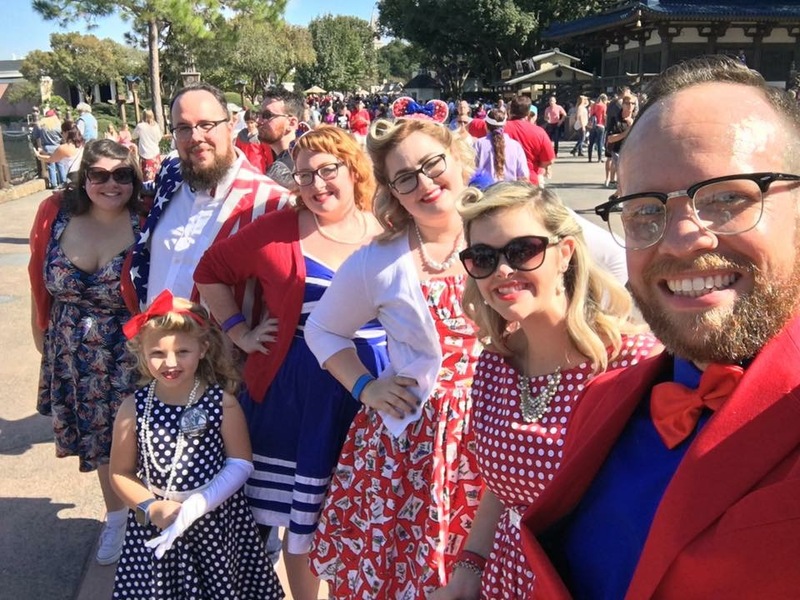 A few of our friends attended the Magic Kingdom event last spring, and after seeing their photos Ray and I decided to attend the next Dapper Day outing. What a great weekend! 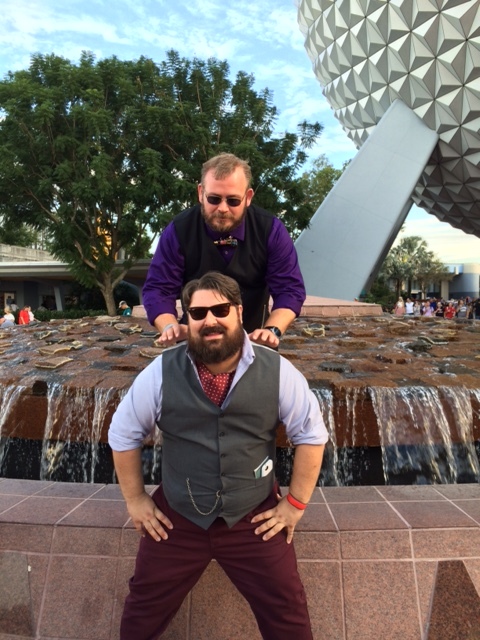 Not only were we able to celebrate Dapper Day, we were also visiting Epcot during their Food and Wine Festival. We visited last year during the festival and I blogged about it here. For me, the stand out food this year were the hummus fries from Morocco, cheddar soup from Canada, peanut butter and white chocolate mousse from The Chew, schinkennudeln from Germany, and pescado con coco from Islands of the Carribean! 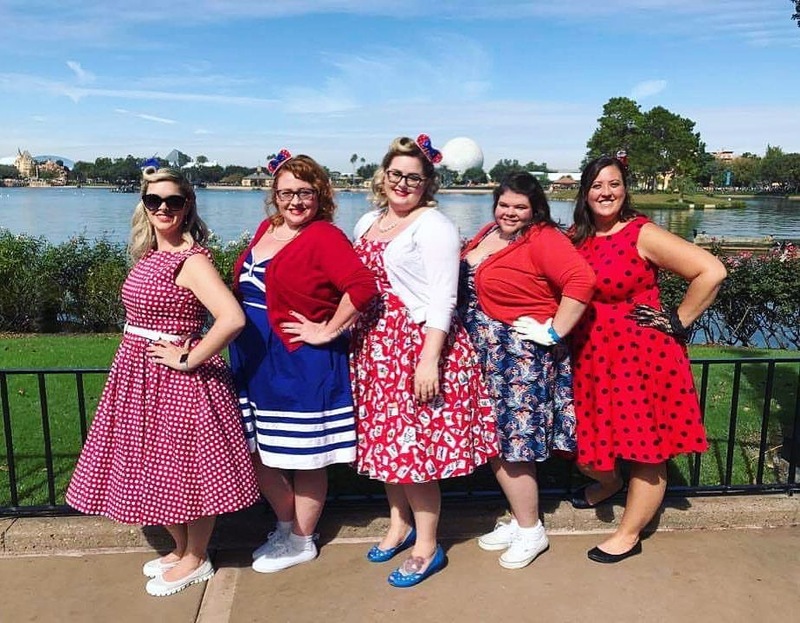 I can’t wait to go to the Spring Dapper Day event! 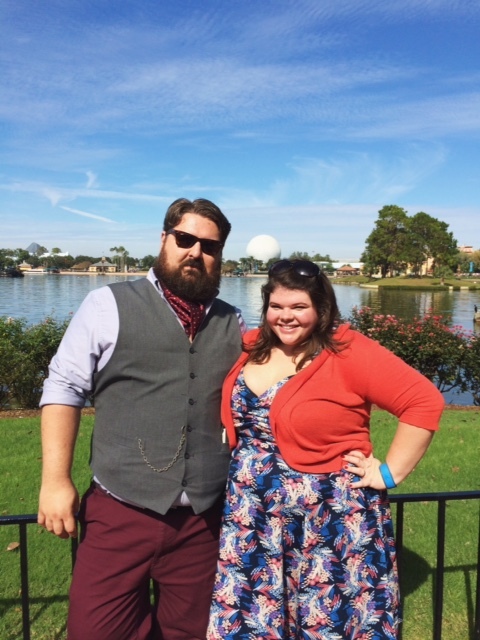 This entry was posted in Life and tagged dapper day, epcot, food and wine, walt disney world on November 16, 2016 by allison. 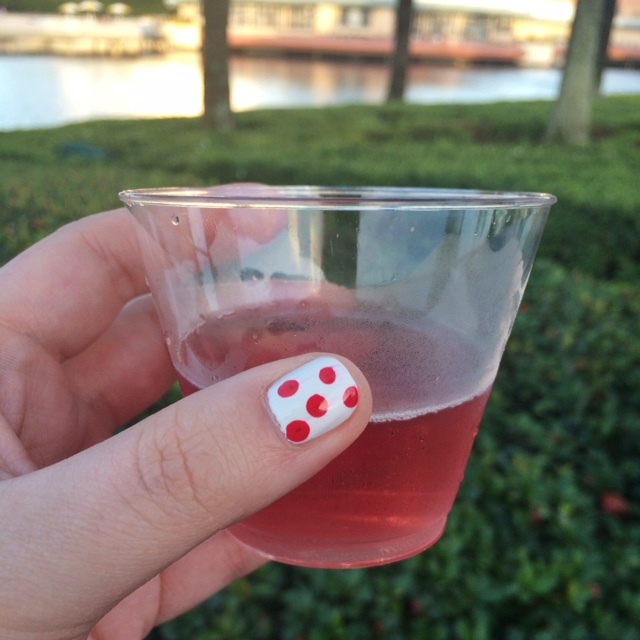 Last week I posted a few snapshot from our recent trip to Epcot for the Food and Wine festival. You can read all about the festival on the Disney website and see the full event menu on the Disney Food Blog. Today Ray, Brie, and I are sharing our full review of all the food and drinks we tried! Allison – This was interesting. I wasn’t sure about the mint pesto at first, but it was my favorite part! Brie – Weird and good. The lamb chop was delicious. The mint pesto was interesting, but worked really well with the lamb, and the potato crunchies added good texture and saltiness. I’d get it again. 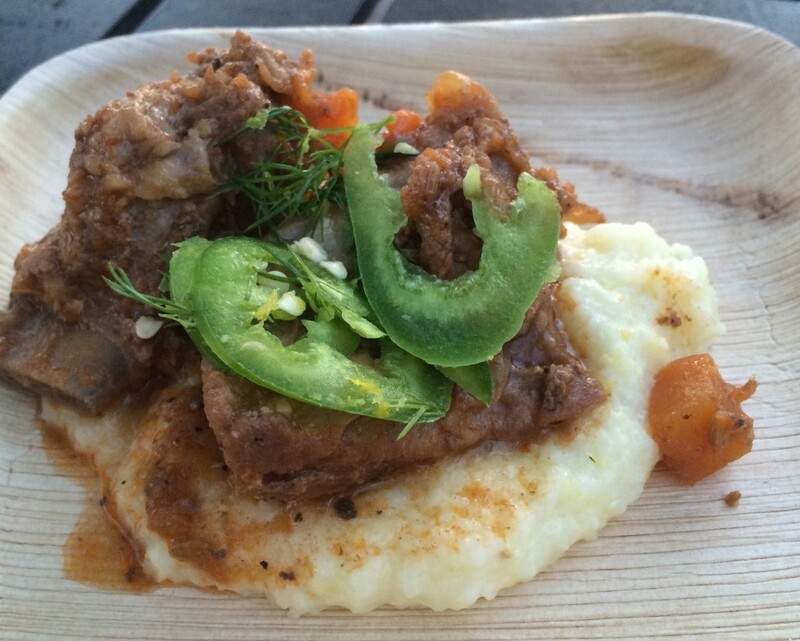 Ray – I really enjoy lamb chops, so I knew I’d want to try this. I wasn’t sold on the idea of mint pesto, but I was trying to go into it with an open mind. This was after all one of the dishes we had later in the day, and we had much stranger things than mint pesto already. The lamb chop was cooked perfectly and tasted so good. 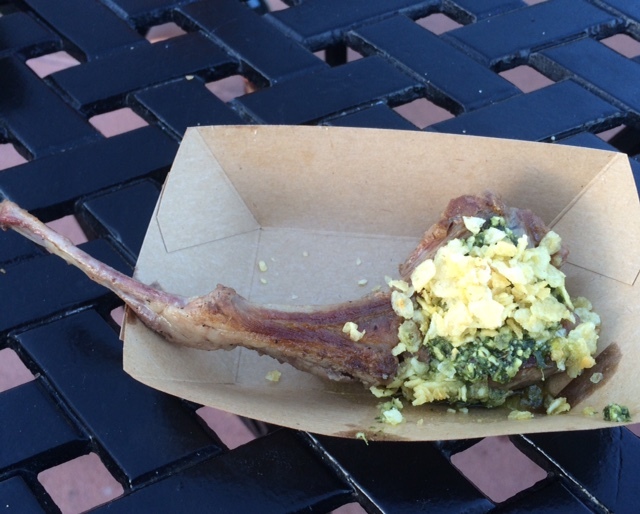 The mint pesto was creamy and mild, and really added a lot to the flavor of the chop. The potato crunches are really the thing that were really like a cherry on top. That little bit of crunch just pushed this over the edge to being a really enjoyable dish. A – Eh, pretty disappointing. I was expecting great things from this dish and it just turned out mediocre. 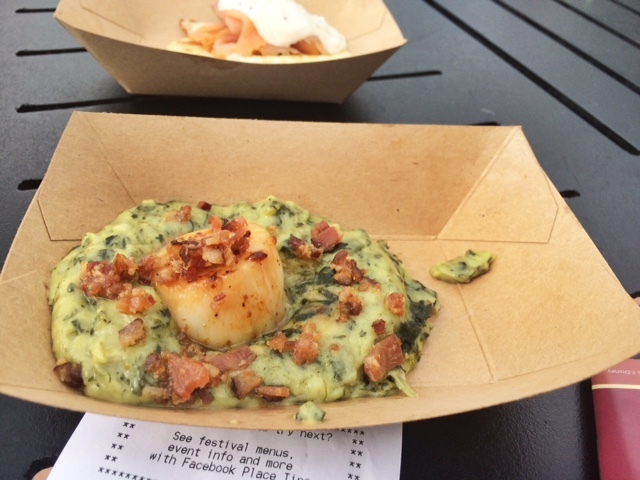 I will say that the portion size seemed to be larger than most of the other dishes served at the festival. B – If I hadn’t seen a picture of this dish before we went, I would have been disappointed. It kinda looked like a big gravy slop, and that’s what it tasted like. There wasn’t much meat, but I liked the couple pieces that I got. The waffle was fine, the gravy was good, the carrots were good. I couldn’t really taste the gouda cream at all though. R – When I hear Gouda cream, I get pretty excited. I love Gouda and felt like the description of this dish sounded delicious. Unfortunately the Gouda cream was almost un-noticeable. If it had been left off I wouldn’t have been able to tell. The leek and potato waffle was crunchy and pretty good. It did seem a little more salty than I expected, but worked out when paired with the gravy. The meat was pretty good, but there just really wasn’t much of that either. All in all it was an okay dish, but I feel like it could have been executed much better. A – Completely worth it. Even the mushrooms were delicious and I typically don’t like mushrooms. TRY THIS! B – I only tasted a small bite of this, and it was pretty good. R – This was one of the best dishes we had. The steak was cooked so perfectly. 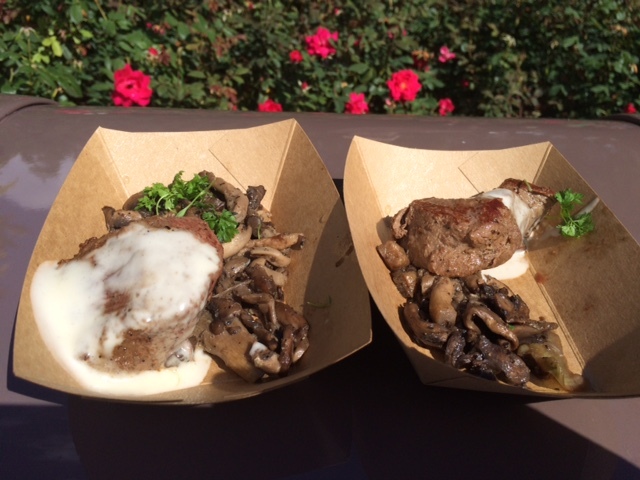 The butter sauce was great and the mushrooms were seasoned perfectly and paired with the filet so well. I would have had a second and third. A – I only had a slip, but it was refreshing and really cold (which we needed). B – Really good and refreshing. 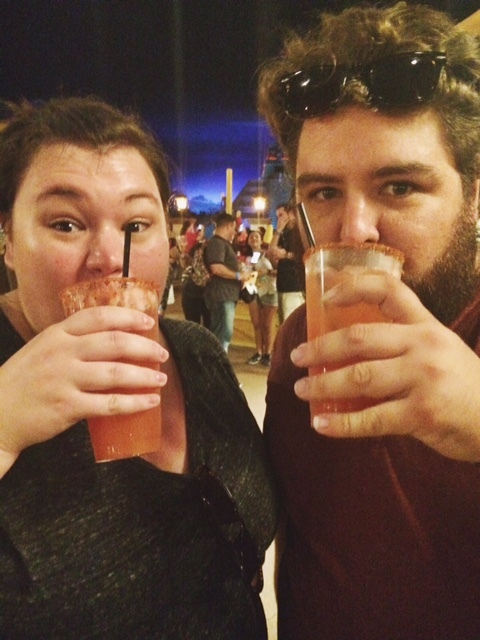 We tried this at a point in the day when we were all sweltering and tired, and this drink was a great pick-me-up. R – This was a kind of sweet drink, but it was about 2pm and blazing hot. 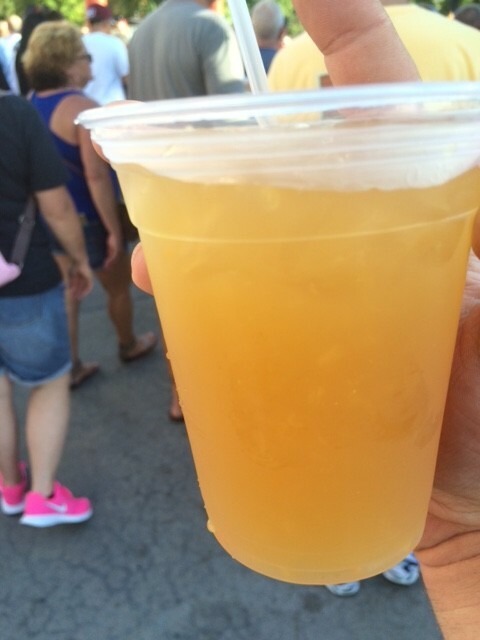 We were all about to die, and I like rum… So I stood in line and got this because it was cold. I honestly think this may have saved our lives. It was very refreshing. A – I guess I’m a hard cider fan now? The elderberry cider was my favorite and now that I’m home I NEED it. Ray immediately broke the pumpkin cider cup, so I had to risk my white shirt to drink it. B – One of our best decisions. 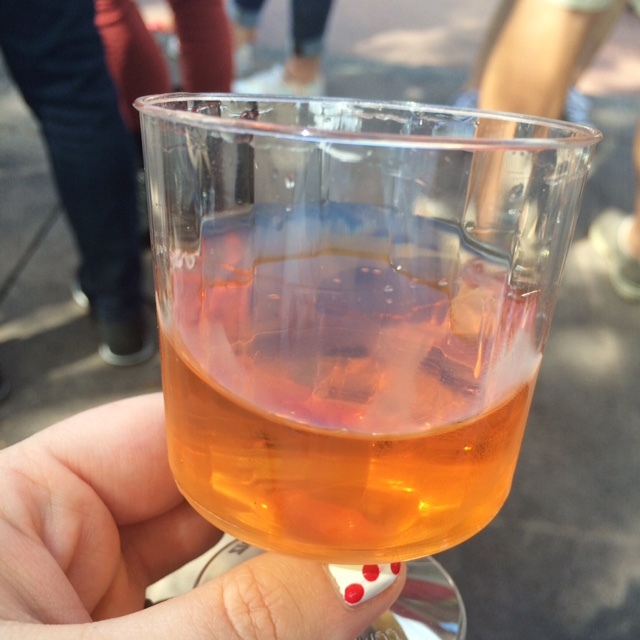 There was pumpkin cider, raspberry cider, elderberry cider, and dry pear cider. All were good, but the dry pear cider was definitely my favorite. I’ve been wanting it ever since. 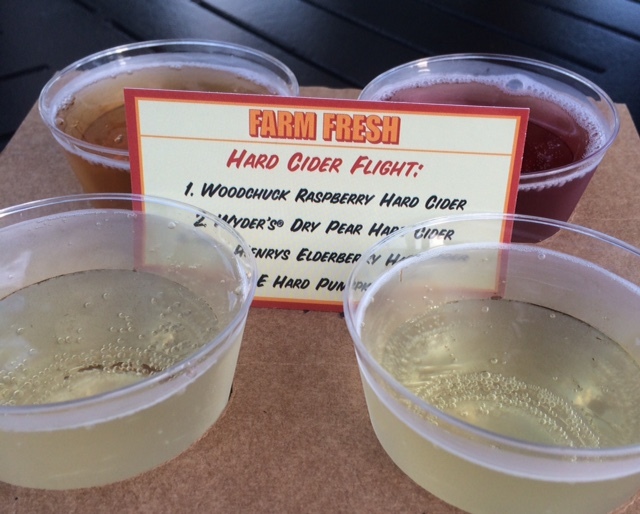 R – I’m the only one who wasn’t wild about the cider flight. It was all pretty good, and surprisingly I didn’t hate the pumpkin cider. But I didn’t really have a favorite. I can take or leave a cider. A – Too sweet, but not terrible. 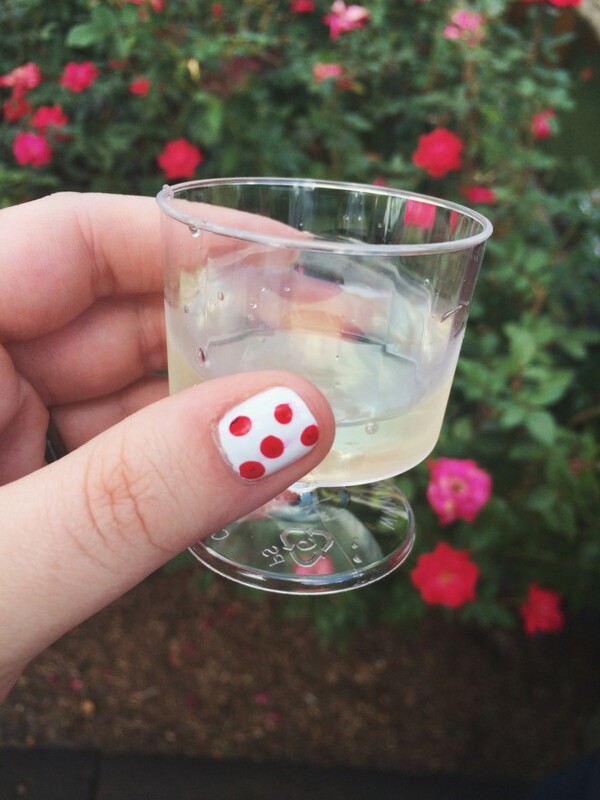 R – I thought this tasted exactly like what key lime wine should taste like. It was pretty good, but I don’t know if I’d drink a bottle of it. 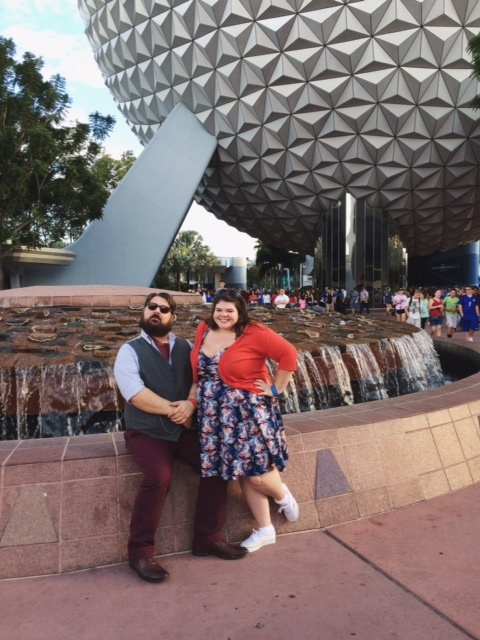 A – The last time Ray and I went to Epcot we skipped France and I have no idea why. I wanted to make sure we experienced it this time. I walked into the bakery expecting to get a macaron, but realized I needed chocolate and ended up getting a chocolate croissant. It was delicious and it saved my life. Even though this list is super long and looks like we gorged ourselves all day, we actually only had a small bite or two of each item. Well, I ate almost this whole croissant and it was exactly what I needed. B – I ordered a beignet with chocolate hazelnut spread inside. It was delicious. I almost wished the Nutella-like stuff wasn’t in it, because the actual beignet was so good. This bakery stop was also one of our best decisions. Absolutely everything sold here looked wonderful. R – I got a chocolate mousse with crunchies on top. This was so good. It was a great break to get out of the sun for a little bit and I think the sugar helped get me going and ready to brave the crowds again. B – Really good. Glad we got this. 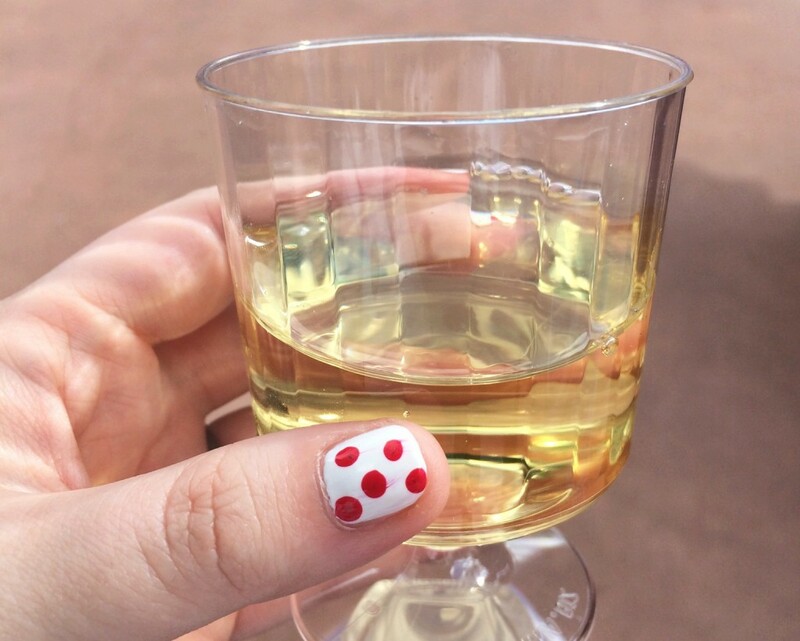 R – Rieslings are pretty good. But I like lots of wines. A – Ooooooh! This was good. B – I really liked this and would absolutely get it again. The pork was flavorful and moist, pineapple chutney was good (but really it was just crushed up pineapple), and mine had a lot of the spicy mayo on it. This is in my top 5 fave foods we had. R – I think I was the least impressed by this. I didn’t get any of the spicey mayo in my bites and I wish I had. The pork was pretty good. I’d probably try this again, but it wasn’t life changing. A – Surprisingly fresh with a great texture. Definitely get this if you’re a sushi person. B – Nice and fresh. Not bad at all, but I wouldn’t get it again. We’d just watched the Top Chef season 2 finale, which was in Hawaii, and they talked about tuna poke for like an entire episode. So it was fun to try it. R – This was surprisingly fresh and good. It is raw tuna though, and early in the day I could only have so much of that. It was also very salty. Not too salty, but it did seem pretty salty. B – Not into it. R – I didn’t hate it. It really just tasted like pineapple wine. It was sweet. A – Ugh. I just can’t get behind pineapple juice. R – I’ve really been into Mai tais this summer… This is one of the worst I’ve had. Save your $7 and I’ll make you a great one. A – I only had the tiniest bite, but I didn’t love it. The mashed potato topping tasted fake!! I just don’t care about non-sweet pies! B – I also only had a tiny bite. It was fine. I’m never into mashed potatoes as a top crust. R – This was really good, but it was hotter than lava. I burned my tongue pretty bad on it. But the taste was pretty good. 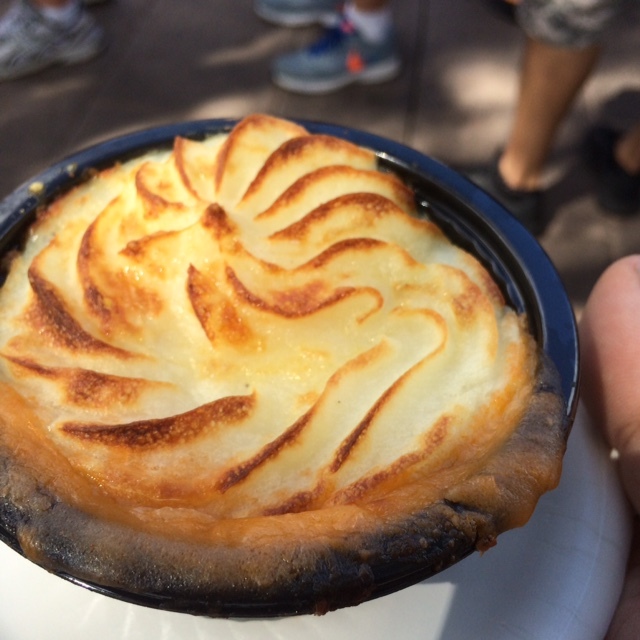 It was like a shepherd’s pie with a seafood bisque under the potato. I enjoyed it. A – Best drink of the festival!!! Two thumbs up! B – This was good. I thought I would hate it, because I hate fake honey flavor, but I didn’t!!! R – I loved this. I’m going to have to find some of this for me. A – A good roll and a good size. Honestly, you could probably get something comparable at a nice sushi restaurant anywhere… but I’d still probably get it again. B – Just a good sushi roll. The volcano sauce was good and spicy. A – I only got water while in Mexico, but I’ve had this margarita before. It’s pretty good, but not worth the line wait. It’s best to get to this bar when they open (12:00pm) because the crowd can get pretty wild. B – Ehh, I was disappointed. It wasn’t a bad margarita, but it was expensive and a very long, slow line. I will say that it was stronger than it tasted, though. R – See, this is a little expensive, and if you don’t go there and wait for them to open you have to stand in a line for 30min+ but it’s the best bang for your buck. They don’t skimp here. The two margaritas I’ve tried (blood orange and avocado) have been great! A – I think I had a bite of this, but I don’t remember. So, I guess it wasn’t memorable? B – This was basically a meatball in a pita. A little dry, but good. A – On the real, this tasted like a southwest egg roll and I loved it. I could have eaten the whole thing in one bite! Unfortunately, it was about the size of my index finger and all 3 of us wanted a try. B – The second I read this description, I knew I needed it and would love it. And I was correct. This chicken roll was delicious! I have no idea why we only got one. R – I only had a bite of this, but it was good and spicy, like spices and spicy. I liked it a lot. I would have skipped pita meatball for this again. A – Ray drank it all!!! R – Typical sangria, but it was nice and refreshing since it was pretty hot. A – This was good, but I would skip it next time. This empanada can be found at any semi-ethnic restaurant. I don’t think we finished it. 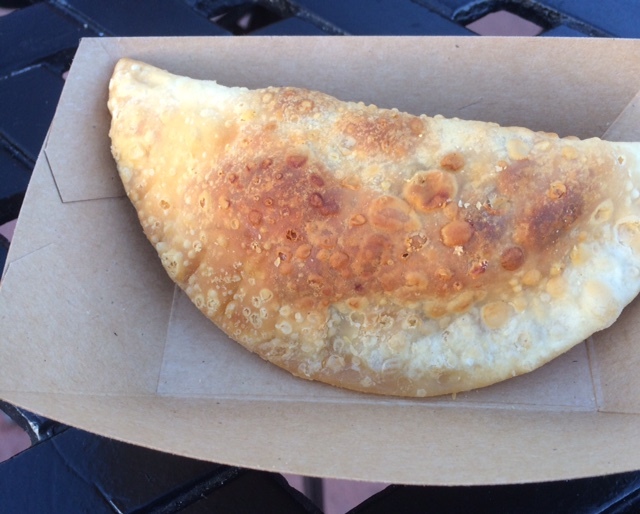 B – Just your typical empanada. Good, but no need to get it again. A – I only had one tiny bite. 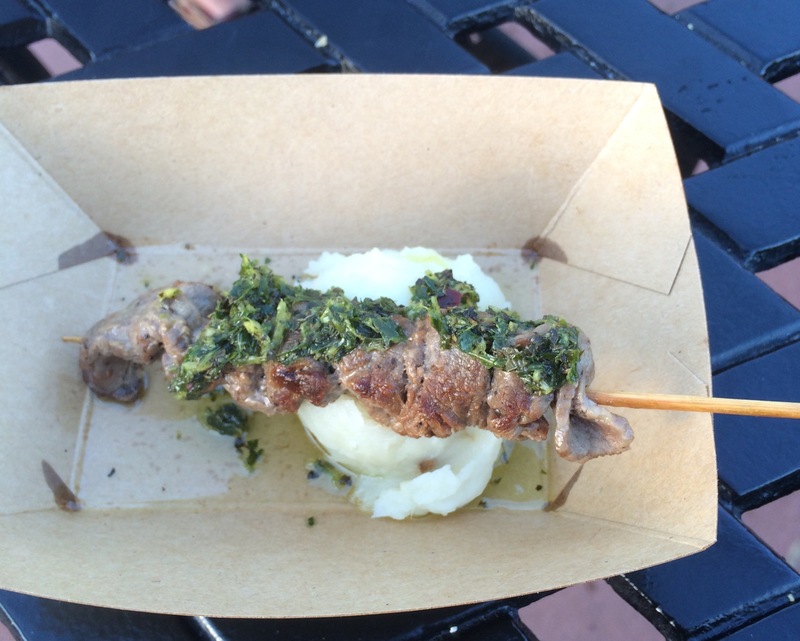 I loved the chimichurri sauce, but the meat wasn’t my favorite. B – This was pretty good. I kinda wish I had gotten my own. The chimichurri sauce was real good. R – The meat is a little tough, but still good and the sauce was amazing. I’d say this is worth a try, just know and be prepared for the meat to not be super tender. A – A+!! 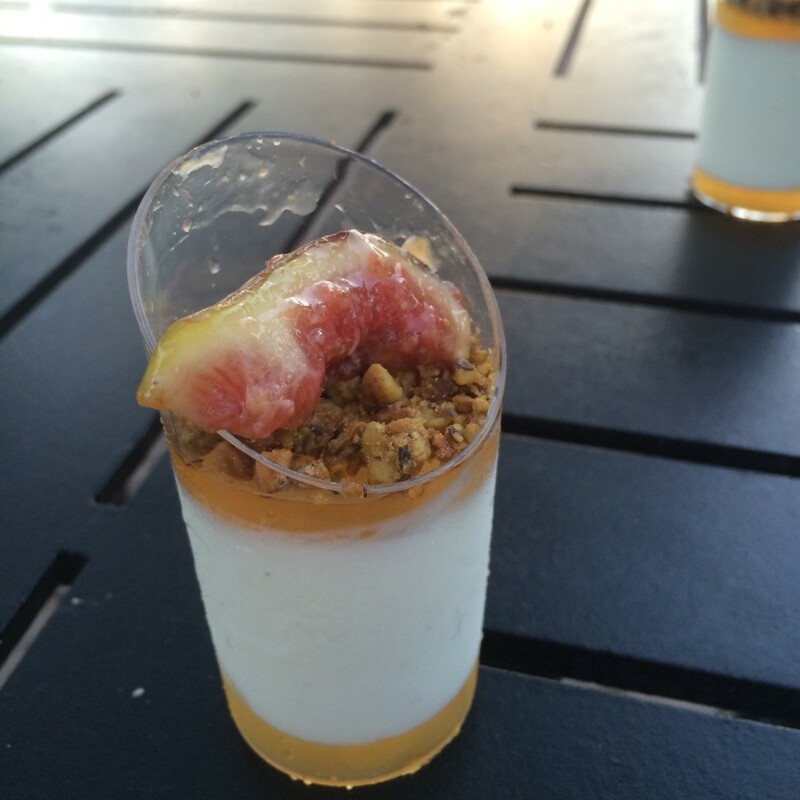 This isn’t exclusive to the Food and Wine Festival. 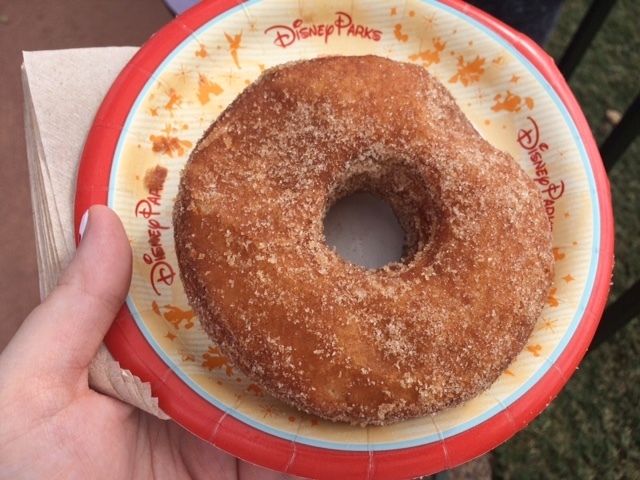 You can purchase a cronut any old day at Epcot… and you should! B – Guys. This cronut is just to DIE for. It’s one of the most delicious things I’ve eaten in my life. We got three in total… and like, they’re pretty big. 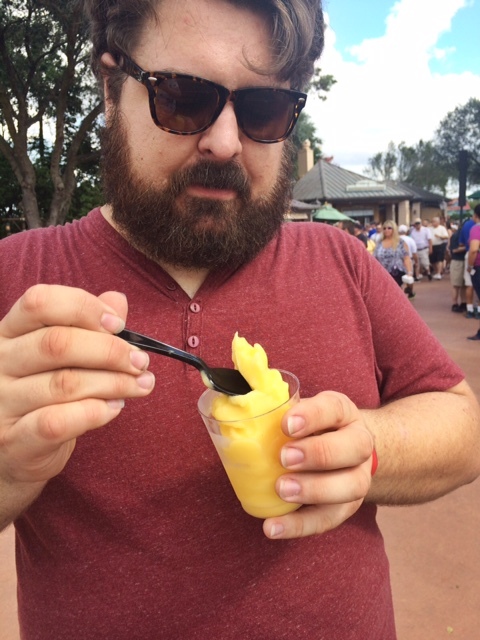 A – Dole Whip is always good, but especially with rum. B – I only had a tiny taste of this, but it was really good. I was kinda over the taste of pineapple by the time we got this, but normally I would’ve been super into it. A – This was something I was really looking forward to. It was good, but not great. 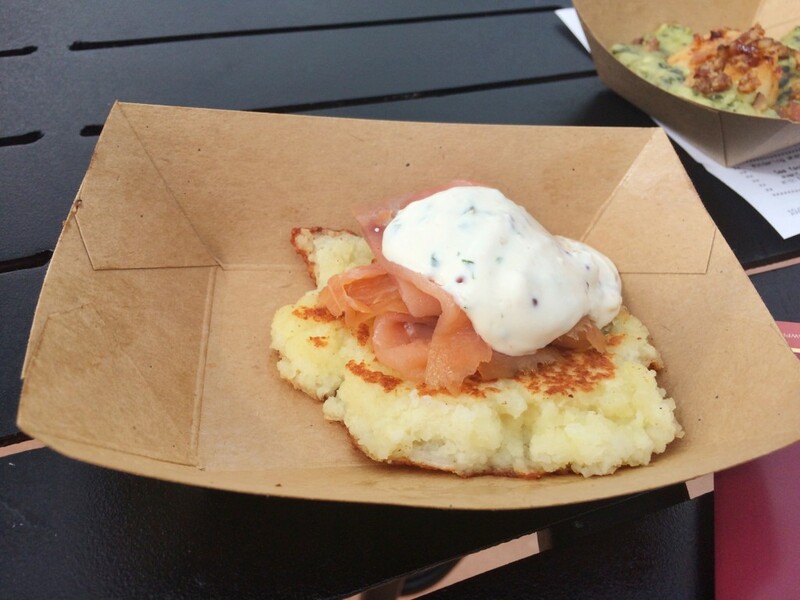 The herb sour cream and the salmon went really well together, but the pancake was rubbery. Who wants a rubber pancake? NOT ME!! B – I was disappointed in this number. I expected it to be awesome, but it was just kinda boring. R – Herb sour cream is just a basic thing. The salmon seemed more raw than smoked. honestly I’ve thought this whole time that it was shaved raw salmon until i read the description just now to write this. So, for raw salmon it was good. For smoked salmon, I’m unimpressed because it tasted raw. The potato pancake was, unfortunately, forgettable to me. A – My favorite dish of the day! Every element to this dish is fantastic! DO NOT SKIP! Also, maybe get your own. Splitting one scallop three ways is just kind of sad. All I can think about is how to recreate this dish. B – This was my number one food (besides that cronut). 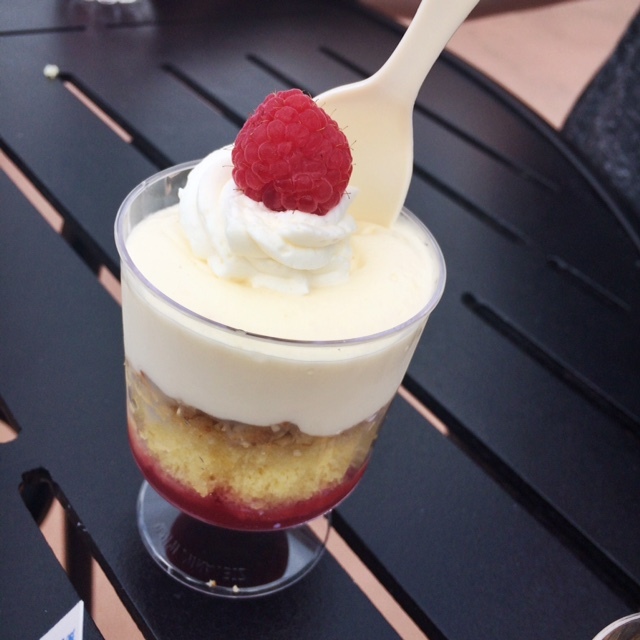 If for some awful reason you can only get one food at the Food and Wine Fest, this is the one you need. I’ve been dreaming about it for days. A – This was really good without being overly sweet. Kind of tiny for 3 people to get a really good taste. B – Oh, this was really good too. It had like a raspberry sauce on the bottom and was a pretty generous portion. I would get it again. R – I don’t remember anything about this. A – Eh, I’m not a scotch girl. B – Poison!!!! I’ve never hated three liquors more. R – Okay, i would just buy the 18 year instead of the flight here. 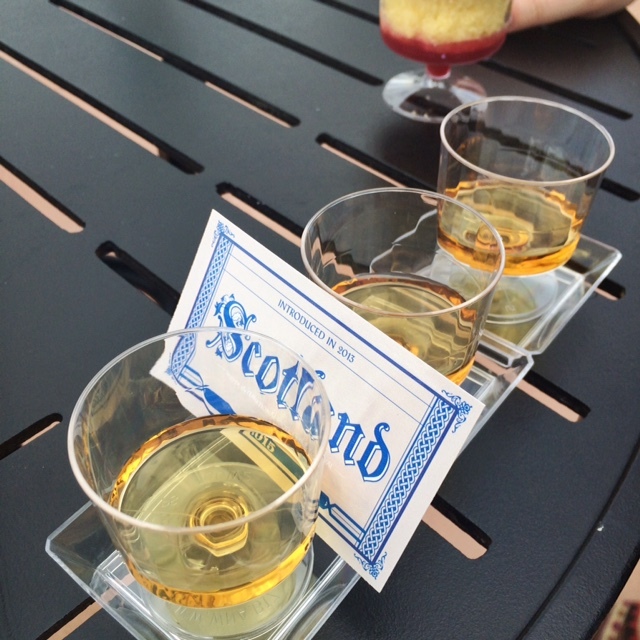 Unless you’ve never had the pleasure of tasting the difference between several different years of scotch. it can be pretty fun. I like scotch though. B – I didn’t get to try this, sadly. See my saga below. R – I got these and the panna cotta’s and then waited around forever for the two girls. (see Brie’s saga below) I was trying to save some of it for everyone to try, but time was just ticking away and grits are only good for so long. So, I ate all of this myself. Even after waiting a long while, everything was delicious. This was an afterthought, i only went to the sustainable chew to get these panna cotta things, and ended up seeing this and deciding i would try it. Guys, it was good. i know this isn’t one of the countries, but don’t pass this up. A – SO DISAPPOINTING!!! This sounded so delicious, but the texture was just totally off. I was waiting in anticipation to try it and couldn’t even finish two bites. The geletin and panna cotta mixed into a weird curdled-like texture. The “brittle” was just chopped pistachios. It was so bad!! See Brie’s sad saga below. B – Whew, guys. I was CERTAIN that this would be my number one dish. I was sure of it. I love figs and pistachios and vanilla, so how it could it not be to die for? 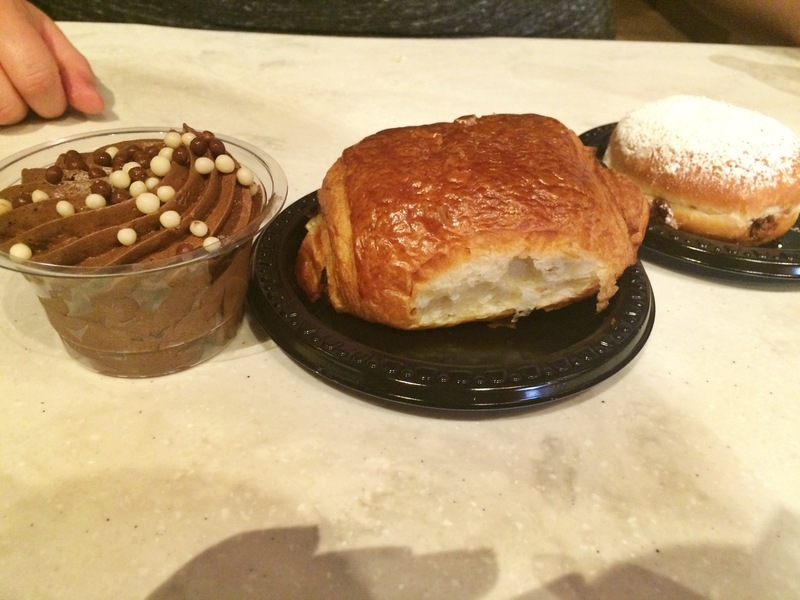 In fact, Allison and I needed it (and another cronut… Shhhh!) so badly that we had to ignore painful blisters and a bathroom emergency to get it!!! 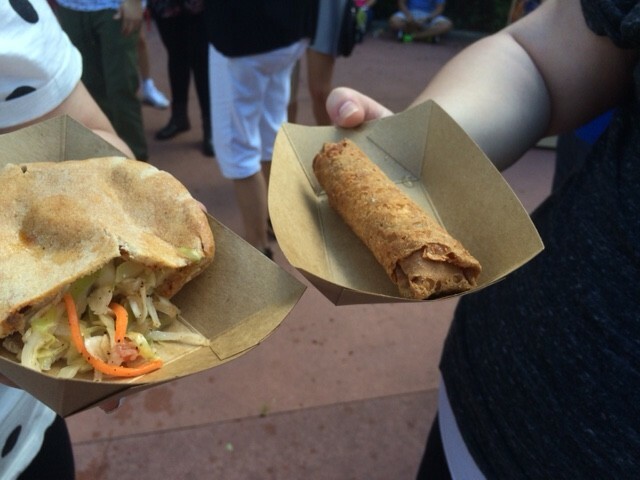 We’d gone through the entire World Showcase and realized we hadn’t been to the Sustainable Chew. We found it on the map, and it wasn’t far from where we were (or from the cronut place, which we’d already decided we had to go back to). There was a ride in a different area of the park that we wanted to go on again before it closed, so the three of us divided and conquered to be as quick as possible. I went to get cronuts, they went to find the panna cotta and spareribs and a bathroom. I was suffering from two gigantic blisters on the bottoms of my feet, so walking was painful. 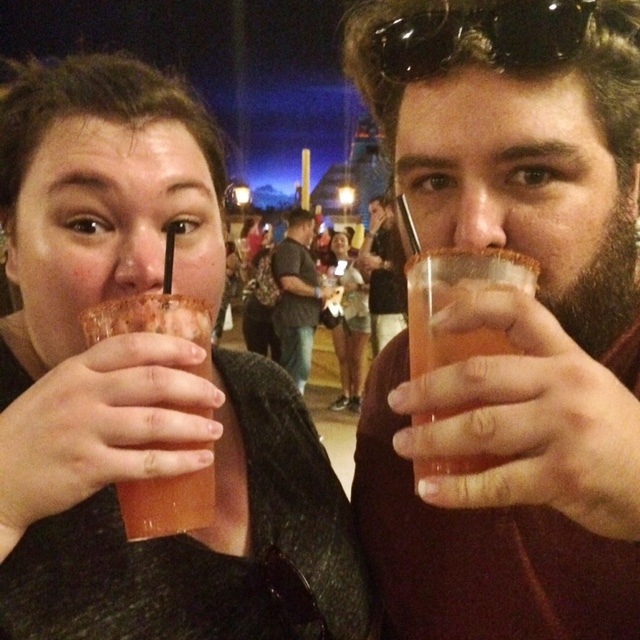 That blood orange margarita had also kicked in, and we’d just finished that hard cider flight and key lime wine. So… I was a little fuzzy. Basically, we all got separated and couldn’t find each other for a very long time. We were finally all back together with the cronuts and panna cotta (Ray had eaten the spareribs and cheesy grits), too late to go on The Land, but worth it because we had the cronuts and panna cotta. Except it wasn’t really worth it, because the panna cotta was awful. Too gelatinous and separated, a weird taste… just really not good at all. Granted, we ate it like 30 minutes after it was ordered. Still, my biggest disappointment of the day. R -After waiting an hour, I didn’t think this would be very good. Who knows if it would have been good fresh… it was mostly a texture issue. 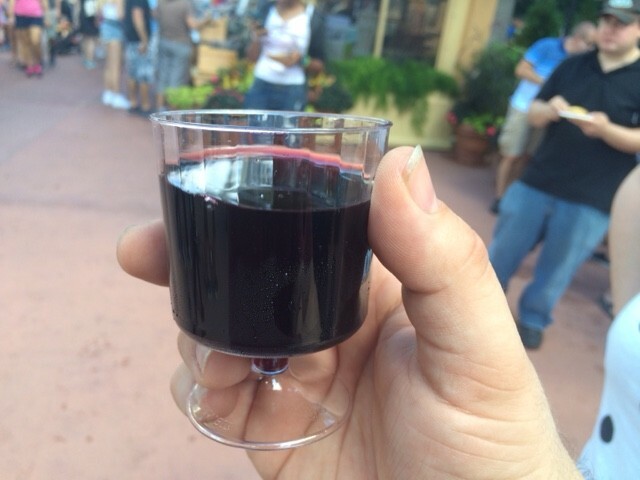 – Going to Food and Wine with 3-5 is great because you can split the food, try lots of different things, and not spend $200. – Most of the food portions are pretty small, but this is how you’re able to buy delicious filet mignon for $7. – The drink portions are also really small, but they don’t skimp on the alcohol! – The lines can get really long, but in our experience they moved quickly (except Japan, those slow pokes). 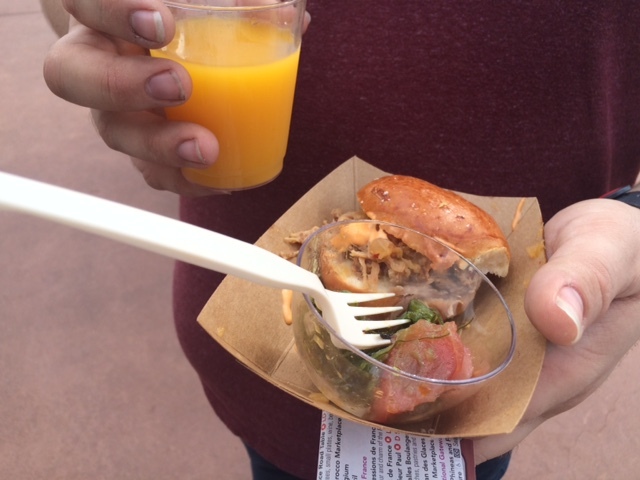 Have you been to Food and Wine? What was your favorite dish? What looks best to you? 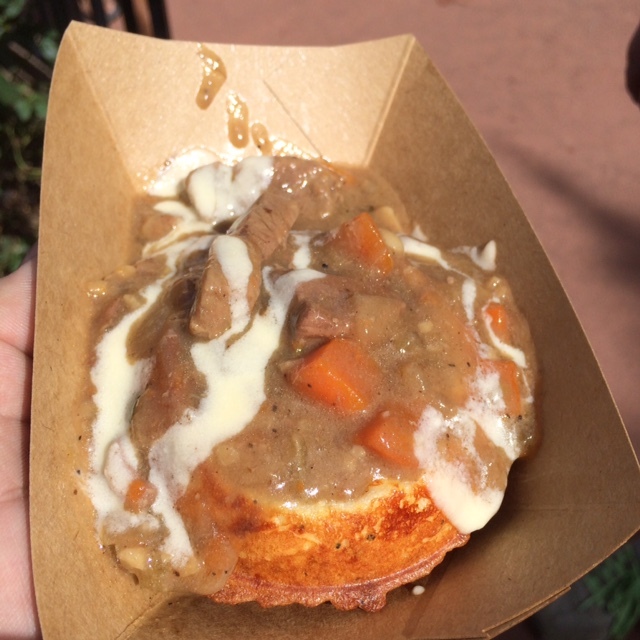 This entry was posted in cooking, Life and tagged epcot, festival, food and wine, walt disney world on November 4, 2015 by allison. Can we take a moment and reflect on my childhood Disney fashion choices? Pink fanny pack + SUPER high wasted jeans + turtle neck + center part?! Whew! 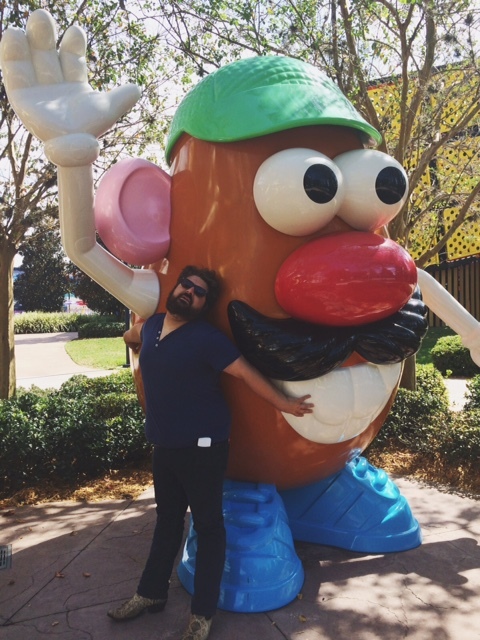 I love Disney World! Like, a lot. Maybe too much for a sensible adult. 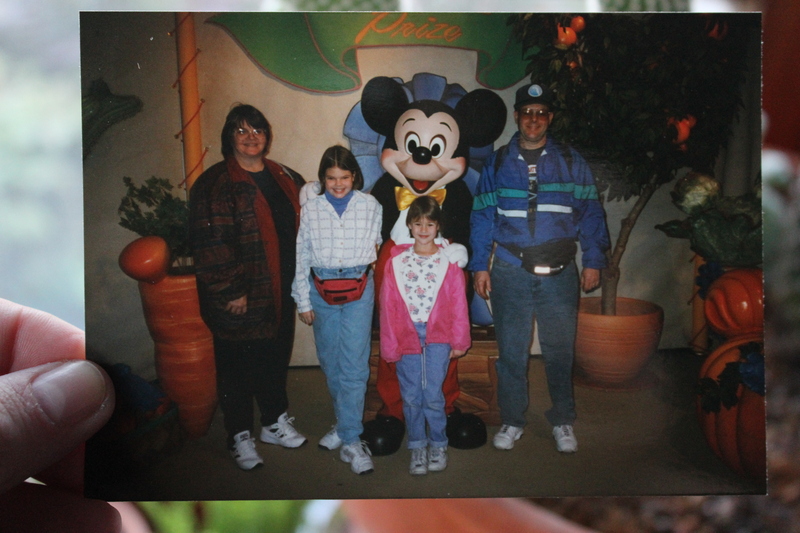 Some of my favorite childhood memories are of my family at the magical parks. 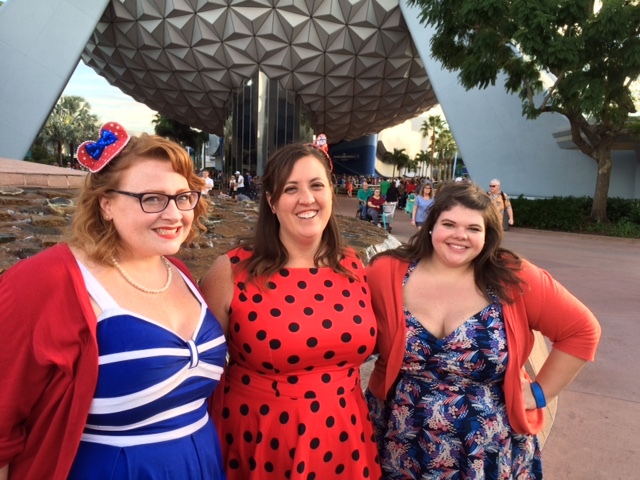 Some of my favorite young adult memories are of my friends and I at the parks. 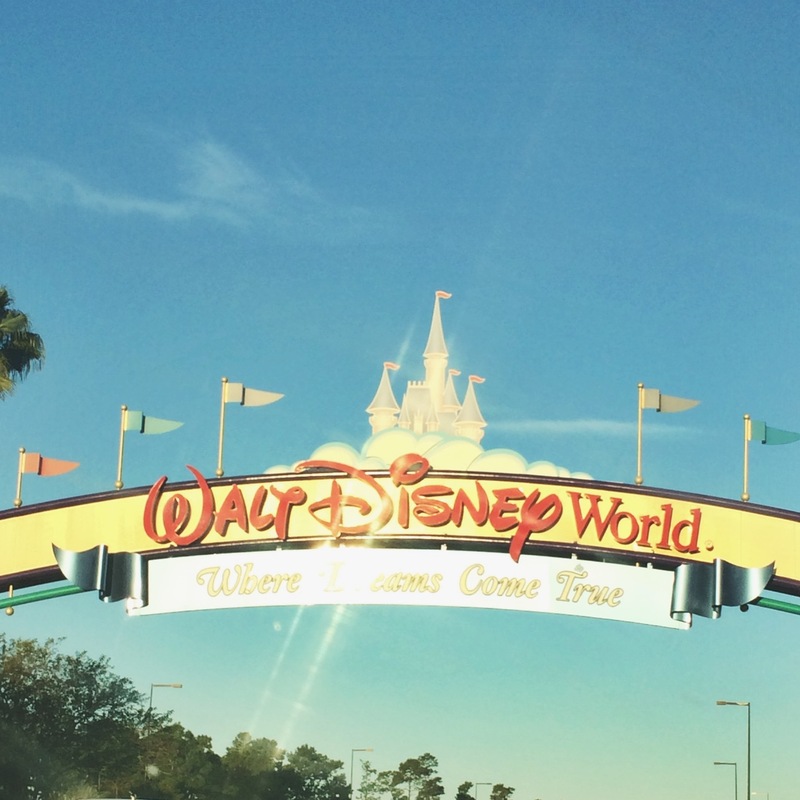 Living only 2 1/2 hours away from Orlando, Disney World is definitely a convenient vacation destination. 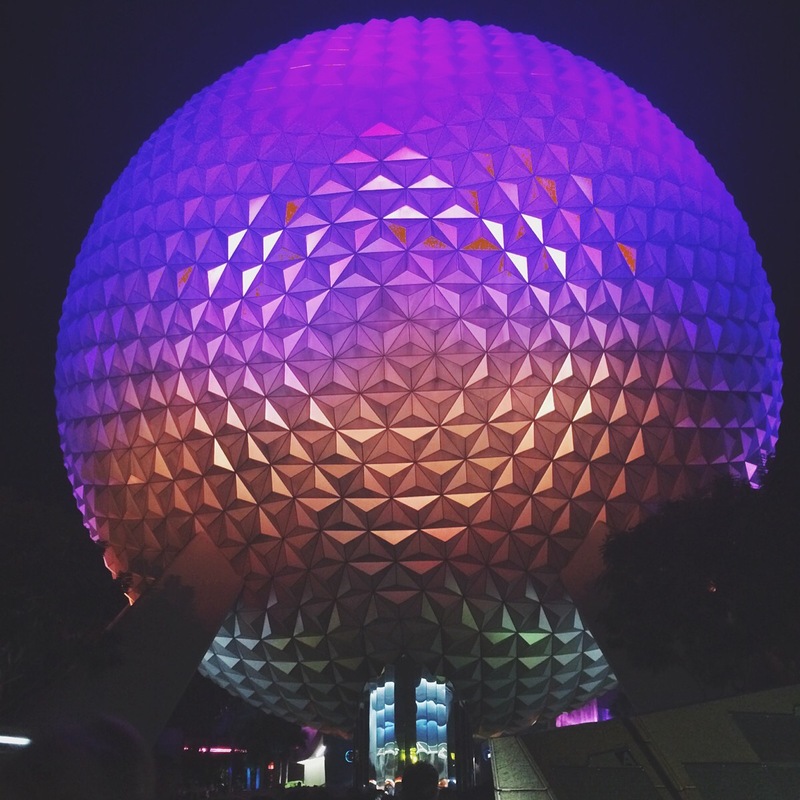 Disney World is magical for children and adults, BUT it can be stressful. 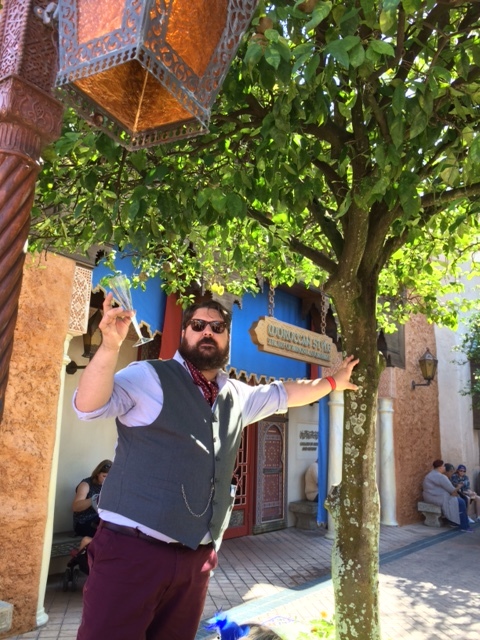 Here are some tips and tricks to have a magical time and keep any stress at bay! 1. Get to the parks EARLY! 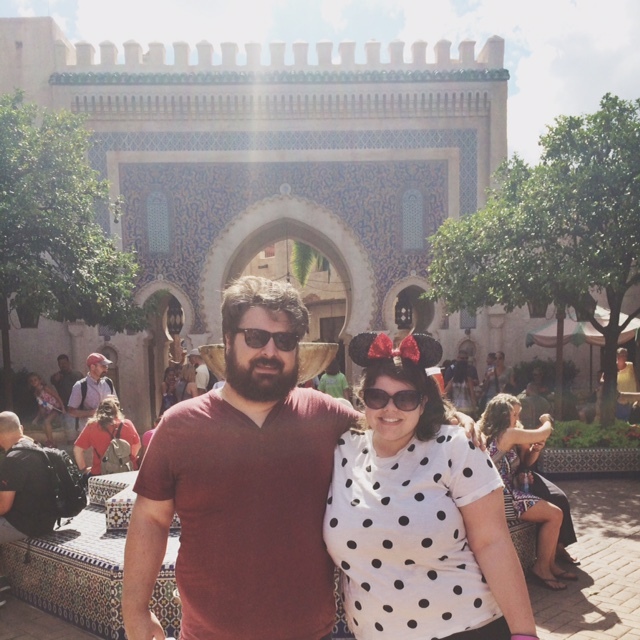 On our most recent trip, Ray and I arrived almost an hour early to the Magic Kingdom. This was sort of on accident (actually we planned on getting there early, then forgot we did it) but it ended up being perfect. 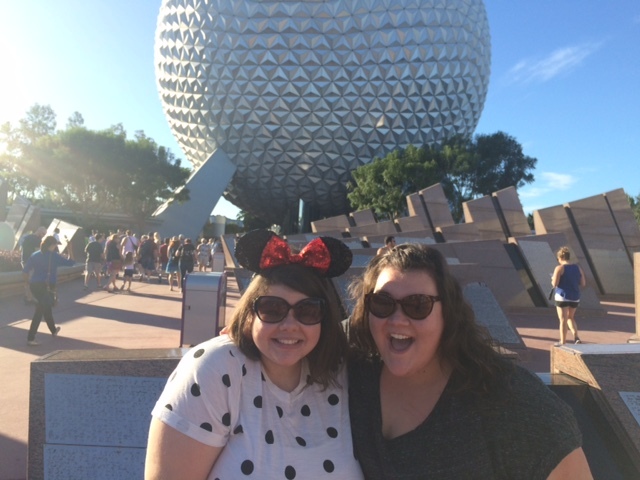 We were able to watch the opening show and be some of the first people to walk into the park. We were also able to walk directly onto the Seven Dwarfs Mine Train with a zero minute wait, while people generally have to wait between 45 mins to 1 1/2 hours in line. 2. Get the app! The My Disney Experience app is for sure a life saver (and time saver) while in the parks. You can schedule fast passes, see wait times, view maps of each park, and even make dining reservations for your party through the app. 3. Have a (flexible) itinerary! Know the rides/shows/parades/restaurants you want to attend before you go. 4. Cool (aka air conditioned) rides! I’ll be honest, going to Disney World in the summer is horrendous and I refuse to go between June and September. BUT, I understand that it’s the only option for some people.There will be times when you just HAVE to sit in the A/C. For this, I suggest finding the closest cool ride. 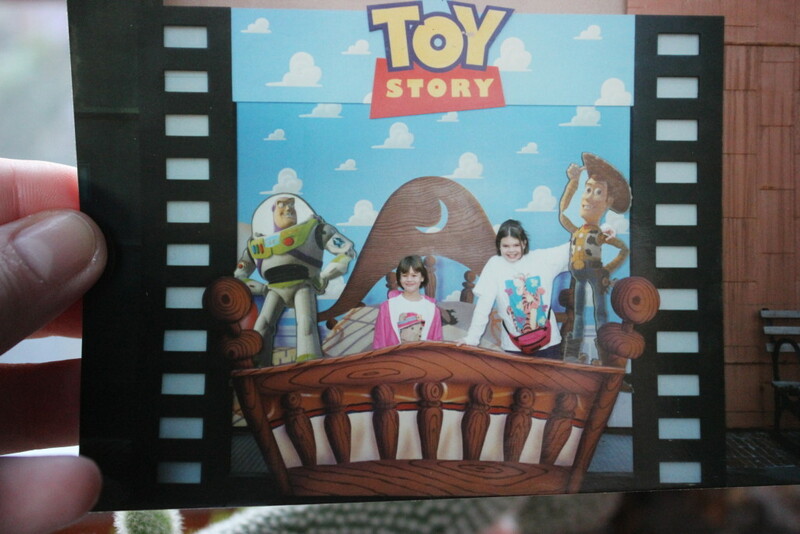 Best cool rides – Carousel of Progress (my personal favorite), Philharmagic, Muppet’s 3D, Ellen’s Energy Adventure, Haunted Mansion, Living in the Land, Spaceship Earth, indoor shows and most boat rides. 5. Utilize FastPass+! 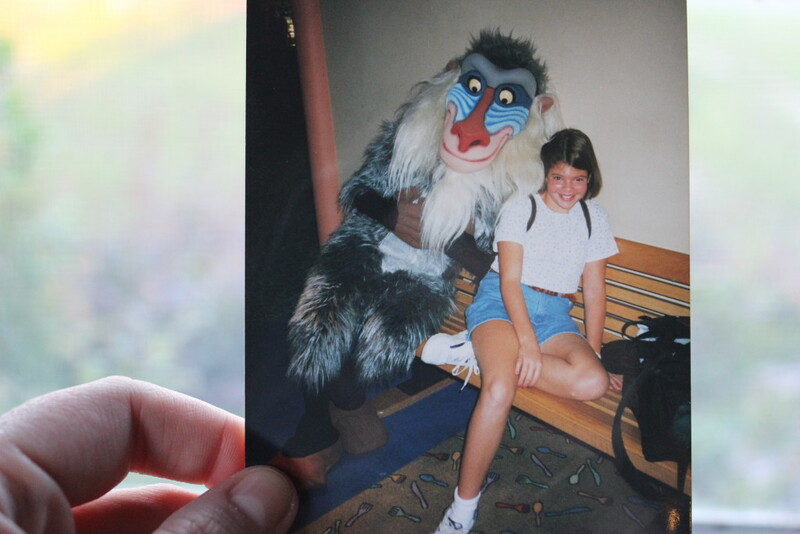 I don’t know if the Disney folks invented the idea of fastpasses, but it’s genius! 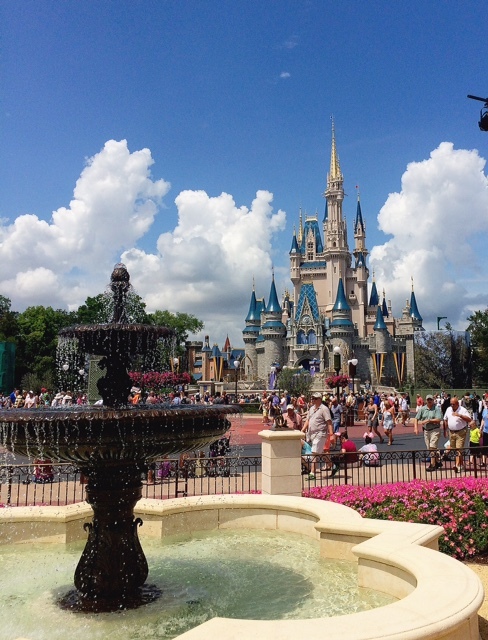 FastPass+ allows you to schedule ride times for your party, resulting in very little wait time. 6. Some rides are better at night! 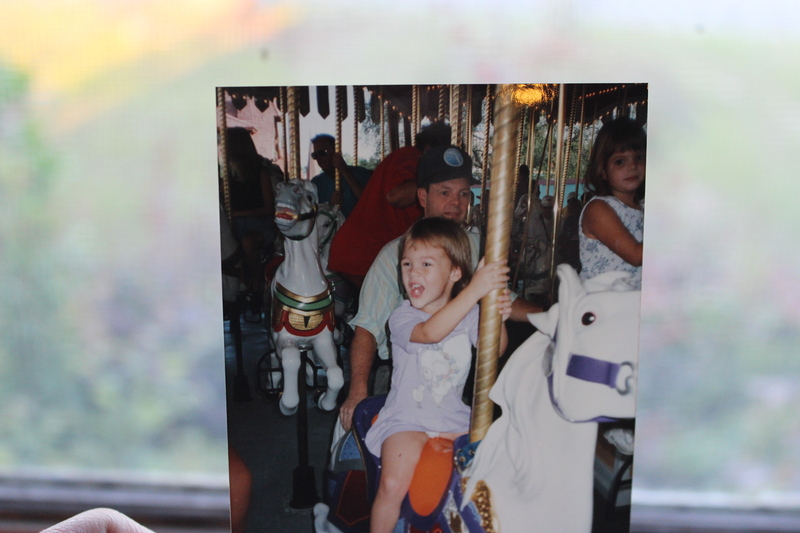 On our most recent trip, the last ride we rode before we left Magic Kingdom was Prince Charming’s Regal Carousel. At night It was more magical and romantic than ever before. Other rides that fall into this category: Astro Orbiter, Tower of Terror, Thunder Mountain. 7. Stay on Disney property! If you’re staying in hotel you MUST stay in a Disney hotel. Yes, they can be a little bit more expensive- but believe me, it’s worth it! Disney hotels provide free transportation from the Orlando airport. You don’t have to worry about renting a car or catching a cab to the hotel. Disney hotels also provide free transportation to and from the parks which allows you to bypass the $17ish parking. This is awesome because Orlando traffic can be kind of terrible and confusing. If you’re staying in a Disney hotel and decide to drive your own vehicle, you still get free parking at the parks! 8. Experience the restaurants on Disney property. 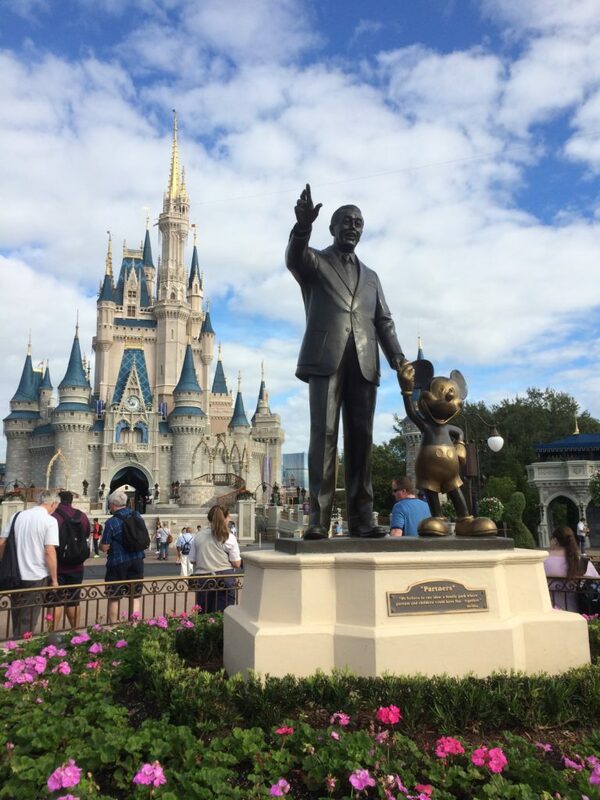 Disney is home to some of the best and highest rated restaurants in the state! 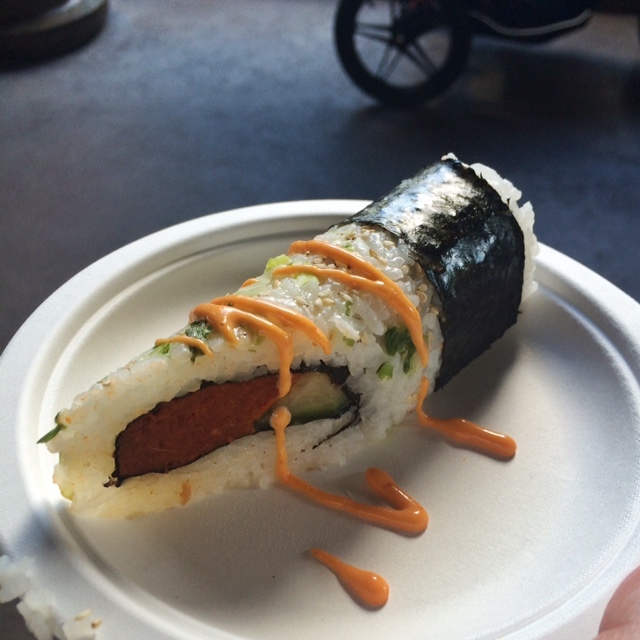 Because of it’s international cuisine, Disney offers so many opportunities to try something new! Disney dining can be expensive, but it can also be a really unique, memorable, and delicious experience. I suggest saving a little extra cash for a nice meal. Most menus and prices are available online, so it’s easy to plan accordingly. When I was a child my parents would bring snacks and lunch food in a backpack for the day and then we would usually go out to dinner. This worked great for our family! 9. Take photos, but not too many! Disney World is magical and a great place for family photos. I mean, magic backdrops galore. Cast members and Photo Pass people will gladly take photos of you with your camera or phone. BUT, don’t spend all your time taking pictures! Fully enjoying the moment is always better than photographing it. 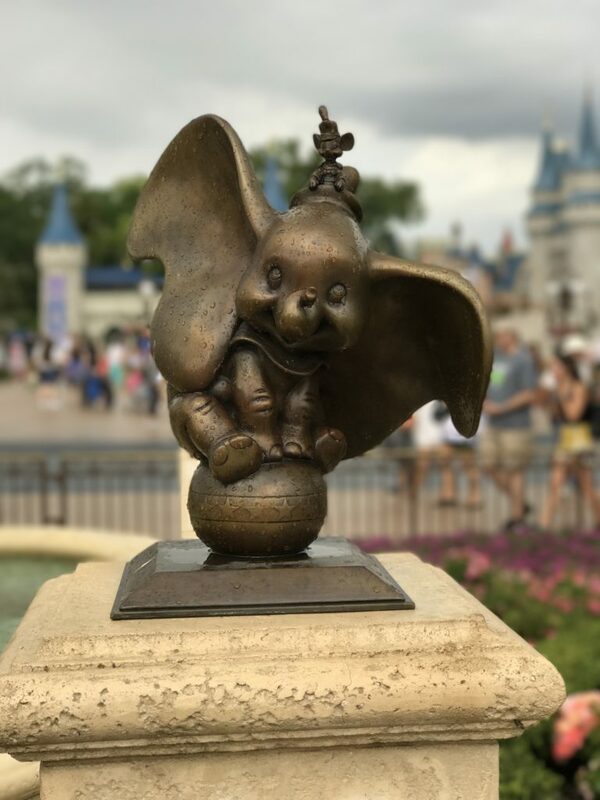 Disney veterans, what are some of your tips? 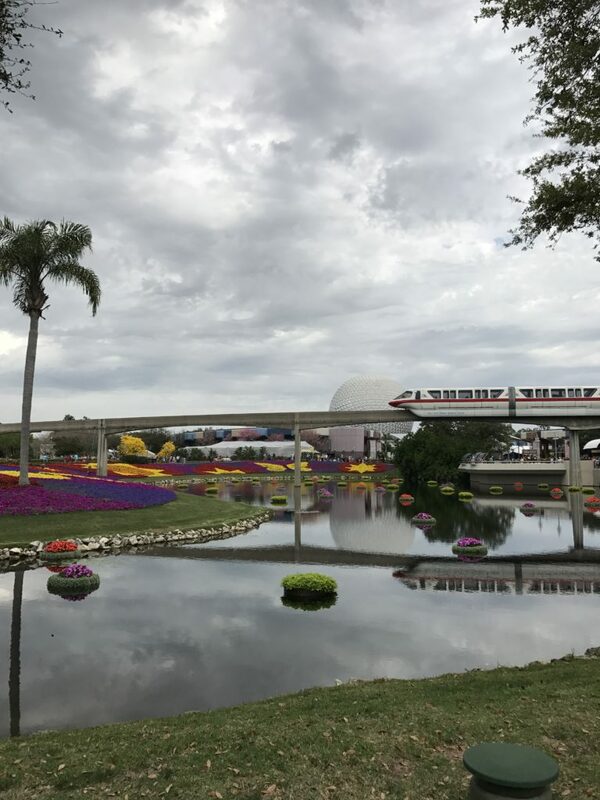 This entry was posted in holiday, Life and tagged animal kingdom, disney world, epcot, hollywood studios, magic kingdom, orlando, tips, tricks, vacation on May 6, 2015 by allison.